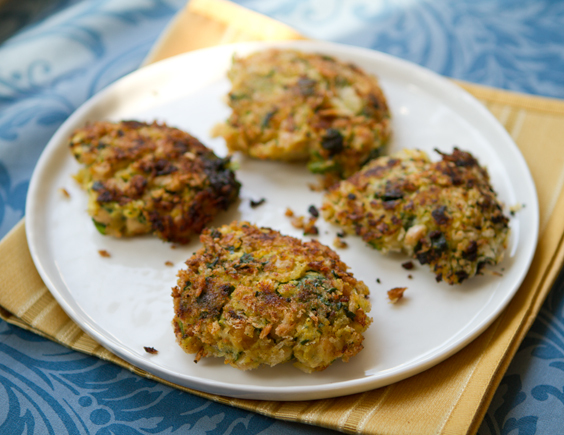 These Green Island Fritters merge creamy, exotic coconut milk with green spinach and rustic beans. A hint of nutritional yeast, agave and a dusting of crispy Panko bread crumbs. 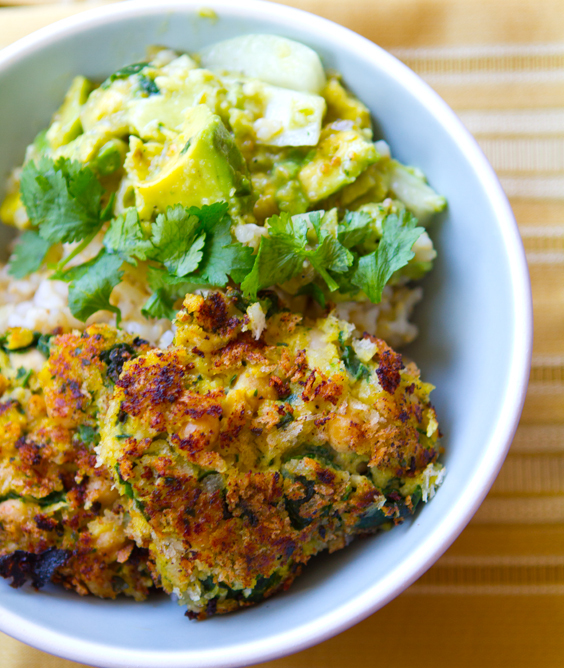 These toasty fritter cakes are served warm, over top some nutty brown rice (quinoa would be nice too) and cool verde guacamole. This cozy meal-in-a-bowl is an elegant, yet low-brow mingling of spicy meets cool - simple meets bold - healthy meets hearty. This bowl would be a fab summer meal since it is a no-oven-required recipe..
Fritter (culinary term) - A small cake made of batter, often containing fruit, vegetables, or fish, sautéed or deep-fried. My fritters usually contain veggies and beans. I often coat them in a light dusting of crispy Panko bread crumbs and lightly saute them in safflower oil. You could also choose baking as a method of cooking - but then you get more of a veggie patty rather than a fritter. My ideal fritter should have crispy edges - and a soft interior. Served hot from the skillet. 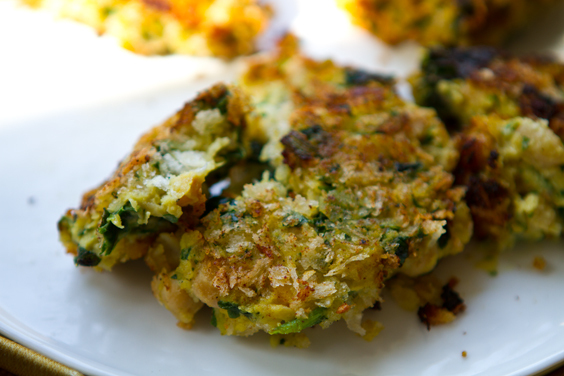 Coconut Milk Spinach Fritters. The uniqueness of this recipe comes that is has a certain richness due to the exotic coconut milk ingredient. Coconut milk and cooked spinach are a naturally alluring combo and when you add in some rustic, nutty textures from beans and crispy Panko - the result is cravable. I also added in some nutritional yeast to enhance the savory, cheezy flavor and some agave for sweetness. Optional chopped jalapeno or a few dashes of cayenne would be nice for a spicy touch. Coconut milk .. "the white part" upon chilling..
* If using fresh spinach, finely chop it and steam or wilt it on a saute pan so that when you fold it into the mixture it condenses into wilted form. 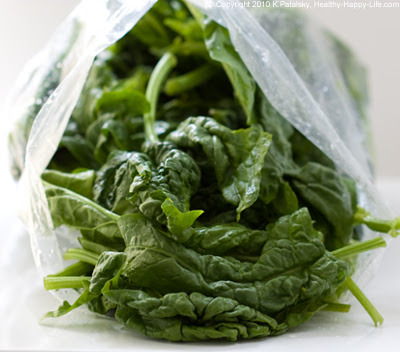 You could also use thawed frozen chopped spinach. 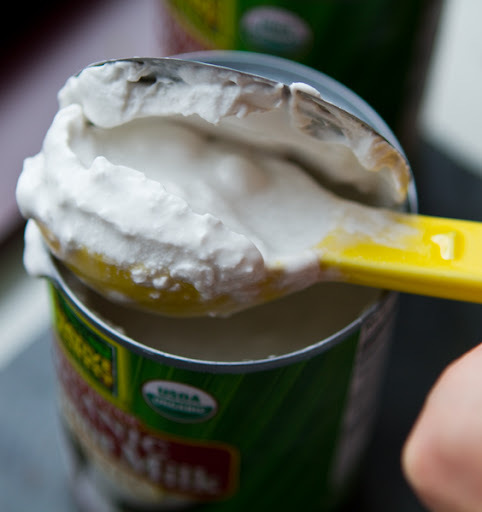 Before: chill your can of coconut milk - just enough time so it separates a bit. 1. 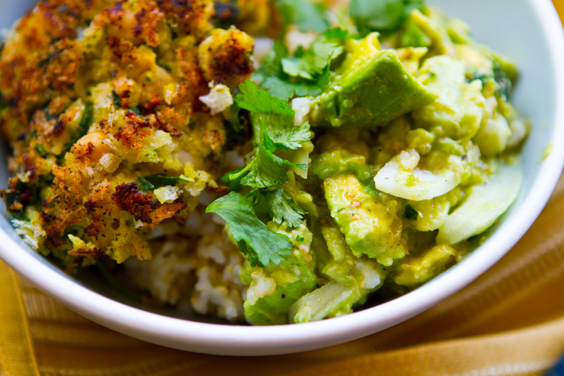 Prepare your verde guac and place in the fridge until ready to serve - the guac is nice when served slightly chilled alongside the hot fritters. 2. Fritters: Add the chickpea and cannellini beans, nutritional yeast, coconut milk, salt, pepper and agave syrup to a large mixing bowl. Mash until the cannelloni beans are all smashed, and about half the chickpeas are smashed. Fold in the spinach and 1/4 cup Panko crumbs. Add in any additional spices like garlic or cayenne - other spices like curry or even Jamaican Jerk or Cajun spice blends would be nice accents as well. 3. Heat a skillet over med-high heat with 1 Tbsp of safflower oil. 5. Cook fritters on each side about 2-3 minutes. If your patties are thicker in size, cover with a lid for a few minutes to heat/cook through the center. When both sides are browned and crispy and insides seem firmed - remove from pan and allow fritters to cool on a paper plate or baking rack. They will be delicate upon removing from pan. Cooling will help bind them in texture. Want more binding power: Add in a 1/2 cup sweet potato or butternut squash puree. Another good vegan binder is almond butter - as I leaned from you guys in these post comments. A "flax egg" may also help. ..but for me, I really don't mind if my fritters are delicate. 6. 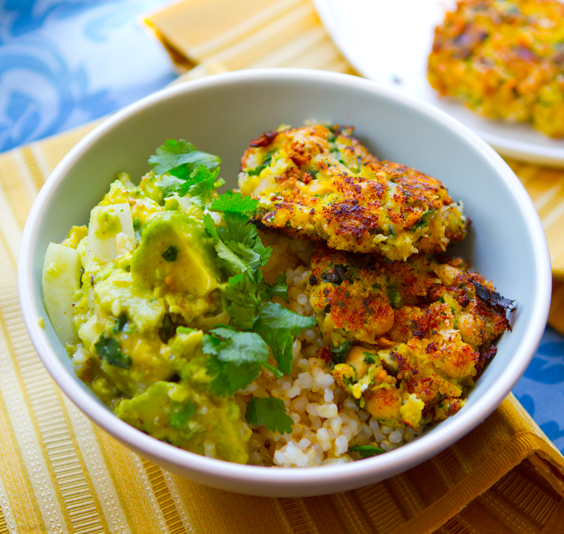 Serve fritter cakes warm over grains + guac. Store uneaten fritters in the fridge - they actually chill + firm up quite nicely and taste amazing too! And yes, these fritters even freeze well. You can re-heat in the oven.